On Site Pool, Spa & Gym. Sleeps 5. Close to Village & Lifts. Family Friendly. Christina One is ideally located in the beautiful Rauris Valley and forms part of the Schönblick Mountain Resort and Spa. Lying in the heart of Salzburgerland, in the Hohe Tauern National Park, Rauris is a superb all season resort offering not only skiing and other winter sports but also hiking, mountain biking, tennis, rafting and paragliding. 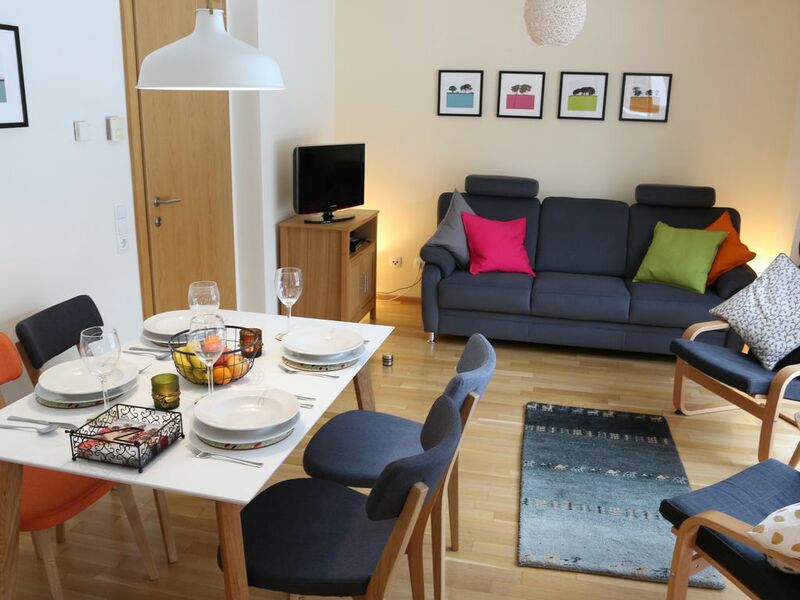 Situated on the ground floor our apartment is ideal for families. The two bedrooms are furnished in traditional pine and sleep five. Bedroom 1 with King sized bed - Sleeps two. Bedroom 2 with a set of bunk beds and a single bed -Sleeps three. The contemporary-style kitchen is fully equipped with oven, hob, fridge-freezer, microwave and dishwasher. The open-plan living/dining area has doors which open onto a terrace overlooking the resort village and mountains. The terrace is equipped with a table and six chairs and is an ideal place to catch the afternoon sun. We welcome children and have a cot and high chair available with no extra charge, children's cutlery, bowls and plates. Solid oak floors throughout with underfloor heating - tiles in bathroom and kitchen. Each room has an independent thermostat. Underground parking for one car with direct access to the apartment, on site laundry, spa and pool. Changeover Day is usually Saturday. Departure by 10 a.m. and arrival after 4 p.m. to allow for cleaning. Broadband: Wireless Broadband is available in the apartment. Ownership: Christina One is owned and managed by an English family and available for rental throughout the year. We live in the 'flat Fens' near Cambridge, our house is 12 feet above sea level so a home in the mountains is a complete contrast. I began skiing as an adult and having caught the ski 'bug' I have skiied nearly every year since. We had done a lot of skiing with our ski club in Austria over the years and knew the Alpendorf area really well. We had often dreamt of buying our own ski apartment and one day in 2007 saw a newspaper advertisement for the Schonblick Mountain Resort in Rauris. The Rauris valley is not far from Alpendorf so we thought it was worth a look. We went out for a weekend and stood in the field where the apartments were going to be built and fell in love with the place. The views down the valley were amazing and when we went up the mountain to see the ski area we knew that this was a perfect place for us to put down some ski roots. A year and a half later we had the keys and began to let Christina One out. We have personally equipped Christina One to a high standard, refreshing and updating the furnishings and equipment during our regular visits. 2019 is our 10th year and we have undertaken a full refurbishment of the living dining area, we hope you like it! When we are not there our local team keep the apartment in peak condition. We have found that the Rauris valley is perfect for year round holidays. We visit in every season and always find something different to do whether it be cycling a new route or visiting a new attraction. In ski boots, Christina One is a convenient 5 minute walk to the slopes and ski hire shops. The nearest supermarket is just 2 minutes away and if we are feeling lazy, we can order breakfast rolls to be delivered to our door each morning. The local restaurants are excellent and the people very welcoming. The swimming pool, sauna, steam room and Jacuzzi can be reached using the underground passageways - ideal when it is snowing heavily - no need to go out in the cold. We have an underground parking space which keeps our car snow and ice free making it easy to set off in the mornings to explore other ski resorts. Family bathroom containing: Bath with shower over, Separate shower, Two wash hand basins Heated Towel Rail and Toilet. There are two coin operated washing machines and a tumble dryer available for use by all guests. These are located in the laundry room in the cellar of Haus Isabella. They require 2 Euro coins. We have a selection of DVDs for children and adults. Schönblick Mountain Resort & Spa is a private, resident’s only facility. As residents you have unlimited access for the duration of your stay, subject to availability*. Thank you for the lovely feedback. Christina One is very conveniently situated for both the main Gondola and for the village shops making it an ideal place to stay. We pride ourselves on being as helpful as possible to our guests and are so glad that you were happy and found the booking process so easy. We look forward to your next stay! What a great apartment, location, and holiday! My wife and I stayed at this apartment in Schonblick over the Christmas holidays with 2 children (8 and 4 yrs old). It is a beautiful apartment with all of the necessities, well kept, perfectly clean, and the owner extremely accommodating. The town of Rauris was also perfect for our family. We ate at a different restaurant every night and were never disappointed. Just about everyone in Rauris spoke great English, were very pleasant and welcoming, and made our stay very memorable. The skiing offered beginner to intermediate level slopes. While not a large mountain, it was still plenty for my family and there are many other mountains relatively close by if you want to get more adventurous. My only complaint about the skiing in Rauris is the difference between the babylift slope and the "blue" slopes was quite significant. I wish there was an intermediate level for my children who took their first lessons in Rauris. In any case, we just got back from Rauris a few hours ago and my kids want to know when the next ski vacation will be. Unfortunately, this apartment and location have set the bar pretty high, so I'm not sure we'll be able to top this one! Thank you for providing such a wonderful place where so many great Christmas memories were made for me and my family this year! Thanks for the lovely feedback, we are so glad that you enjoyed staying at Christina One over Christmas and are delighted that you feel that we have 'set the bar pretty high' for your future holidays. We look forward to welcoming you back very soon. We travelled with our 2 children (8 & 6 year olds) in early Feb 14 for a family skiing holiday. It was our daugher's first skiiing trip and it could not have been a better place. The village is extremely pleasant with lots of bars and restaurants that have a great selection of food. There are 2 supermarkets that stock everything you would ever need for staying in on the occasional night. The apartment was furnished to a high standard and had plenty of room for the 4 of us. All amenities were provided and the resort staff could not do enough to help us, even opening up 45 mins early on our departure date so we could check out. The Karl Maier ski school had an abundance to super efficient and attentive instructors that made sure that our children progressed well during our stay. The medals presentation at the end of the week was a nice touch, which made sure that all students felt special. The walk to the gondola station is only about 5-10 mins even carrying an extra set of skis, then it's straight up the mountain and plenty of runs for all standards. I would definitely return to rauris and in particular this development of luxury apartments. I'm very glad we found this on HomeAway. Thank you Mark for your feedback, we are so glad you had a lovely holiday staying at Christina One. The ski/snow boarding schools are excellent for beginners and those who want to develop their skills and it is good to know that your daughter enjoyed her first ski trip. We hope you took advantage of the lovely pool whilst you were there, a great way to ease those muscles after a hard day on the slopes. We offer returning guests a 5% discount and we look forward to you returning to Rauris again very soon. L'appartement est très bien équipé (micro-ondes, lave-vaisselle, produits d'entretien...), très propre. copropriété calme. Je suis tres content que votre sejour a bien passe et que la appartement vous a plu! J'espere vous accueillir encore a l'avenir! The village of Rauris sits at an altitude of 950m and from here a series of gondolas takes you up to the summit at 2175m. The English speaking ski schools in Rauris are some of the best in Europe and with plenty of wide, well groomed and uncrowded pistes, the resort is perfect for families, beginners and intermediates. The slopes face north-east, ensuring the snow stays in great condition, but snow cannons cover all the runs into the resort for added security. Cross-country skiers and hikers are equally well catered for, with 45km of groomed, cross-country piste and 48km of cleared winter hiking trails. For those wanting to venture further afield, some of the largest ski areas in Austria are within a 20-40 minute drive, including the resorts of Bad Gastein, Zell am See, Kaprun and Ski Amade. Rauris offers plenty to do when the snow melts. 295km of hiking paths cut across the mountains and through the Rauriser Urwald, a primal forest dotted with 80 secluded lakes. National Park guided activities are available and can be booked at the Tourist Information office. The Hochalmbahnen Gondola will whisk you to the Hochalm/Heimalm to view the birds of prey or for some gold panning after which you can walk down or catch the gondola for the return journey. Cycle trails give access to the Pinzgau Mountain Biking Network, cycle hire is available locally. Why not try your hand at gold panning at Kolm Saigurn or join an exciting rafting tour in Taxenbach? Catch your own trout for lunch at the Weixen in the Seidlwinkltal. The Schonblick Mountain Resort provides easy access to the surrounding countryside and hiking routes and is an ideal base for year round vacations. Other Activities: Rafting; snow shoeing; toboganning; tennis. Salzburg is just an hour away by car with its many historic attractions.